Santa Monica Press, 9781891661273, 288pp. "Footsteps in the Fog" is a celebration of the San Francisco films of Alfred Hitchcock. The master director's familiarity with Northern California greatly influenced his decision to use Bay Area locations in several of his landmark motion pictures, and more importantly was often the source of inspiration for many of these same cinema classics. Three of Hitchcock's masterpieces were set in the San Francisco area: "Shadow of a Doubt, Vertigo, " and "The Birds." In addition, "Rebecca, Suspicion, Marnie, Topaz, Psycho, " and "Family Plot" utilized Bay Area locations and/or were inspired by Northern California events and settings. "Footsteps in the Fog" examines these famous films, taking the reader on a journey around the Bay Area, while weaving together cinemagraphic intrigue, Bay Area history and lore, and the timeless elegance of San Francisco and its picturesque surroundings. 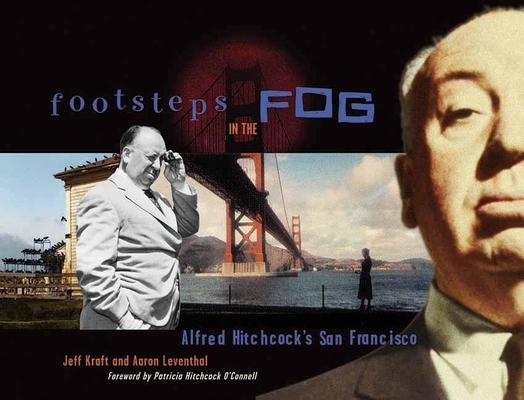 "Footsteps in the Fog" can be used as a companion to viewing the Northern California Hitchcock films, as a guide for visiting the sites and settings used in these motion pictures, and as a source of biographical information about Alfred Hitchcock's personal connections to San Francisco and the Bay Area. Hitchcock loved Northern California; he often entertained Hollywood celebrities at his ranch and vineyard outside of Santa Cruz, and frequented such San Francisco institutions as Jack's Restaurant, the Fairmont Hotel, the Top of the Mark, and the historic Bercut Brothers' Grant Market. Jeff Kraft is an avid Alfred Hitchcock fan who has seen every available Hitchcock film. A long-time Bay Area resident, Kraft graduated from UC Berkeley with a Masters Degree in Public Policy. He lives in Oakland. Aaron Leventhal was born and raised in the San Francisco Bay Area. His passion for photography and suspense films led to his collaboration with co-author Jeff Kraft. Leventhal lives in the East Bay area. Patricia Hitchcock O'Connell is the great director's daughter.